Driving | Where Is Annie? One of the big things that has changed now that we’re home is how much time we spend driving. Bill and I are not happy about it. Granted we don’t drive much. We tend to bike to work and school. Hank takes the bus. We do drive to get a large load of groceries, or to take my parents to the doctor, or to schlep the weekly carpool to high school. But during our trip we spent a whole year not driving. Neither Bill nor I ever got behind the wheel of an automobile. We rode in cars, vans, trucks, and buses and never drove ourselves. 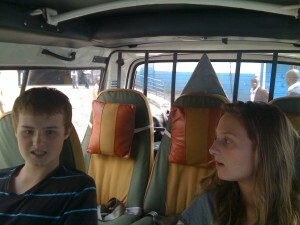 Instead we were chauffeured by the locals. They drove us around their own land, on their own roads, by their own rules. We were their guests. We could never have managed driving in many of the countries we visited. In most of the world it was not like the rule-bound driving of the US. It was wild, unregulated chaos. In Turkey the driving was so crazy we were sure we were going to die. Before we left the States a friend had told us that a stop sign in Turkey was just a suggestion. We soon experienced cringing when the cars sped through the intersections without even slowing down. We held our breaths as our friends from Kaş passed the car in front of us while speeding around a blind corner. 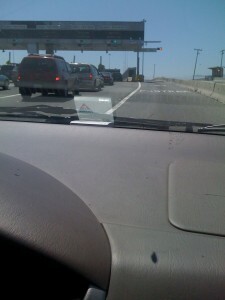 We sighed when we got back into our lane without crashing. And we had to trust our lives to bus drivers. We often rode the smaller buses or “dolmuş”. These buses swayed and lurched but were so packed with people, packages, and backpacks, we were buffered against falling. The overnight buses were larger with luxe seats that laid down almost flat for sleeping. Bill spent one night on the flat bench in the back next to the hacking, coughing Turk. Thank god his TB test was negative when we got back. Cat got car sick on this bus. She and I moved up to the very front. A huge windshield exposed the entire road in front of us. We could only see the broken, painted lines on the freeway as they sped under the bus, lit by the bus’ headlights. The vertigo was intense. 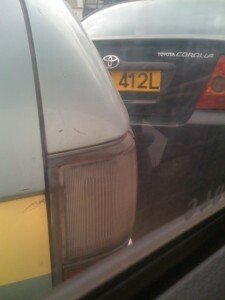 Then the driver sped up to the car ahead nearly touching the rear bumper before changing lanes. The bus swayed. I prayed. Then we went to Kenya. There we knew we were going to die. Our safari guide, Ben, drove us throughout southern Kenya. At first it was hard getting used to driving on the left side of the road. It shocked us every time we looked into an empty driver’s seat wondering who was driving the van. Only then did we remember the driver’s seat was on the right side of the car and there sat the driver. Ben sped through the potholed roads of the countryside and through the dirt roads of the safari parks. We tried to use the malfunctioning seatbelts in the van, but then just gave up and handed over our lives to Ben and to fate. As we toured Kenya with Ben we saw the coffee plantations of the highlands, the tall Kenyan marathoners running the hills, and tons of African wildlife. But we also saw so many smashed cars and flipped over semi trucks. Luckily Ben showed us the elephants and giraffes, then brought us back safely to Nairobi. 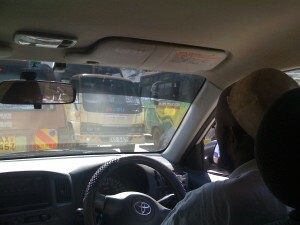 In Nairobi I had a private driver, Ahmed, and learned to trust his driving. Still I’d find myself sucking in my breath as another car edged to within an inch of us. There was no personal space on the roads and the roads were packed. In traffic jams cars stopped within inches of each other. We breathed in the diesel fumes spewing from the trucks as they stopped and started with the traffic. 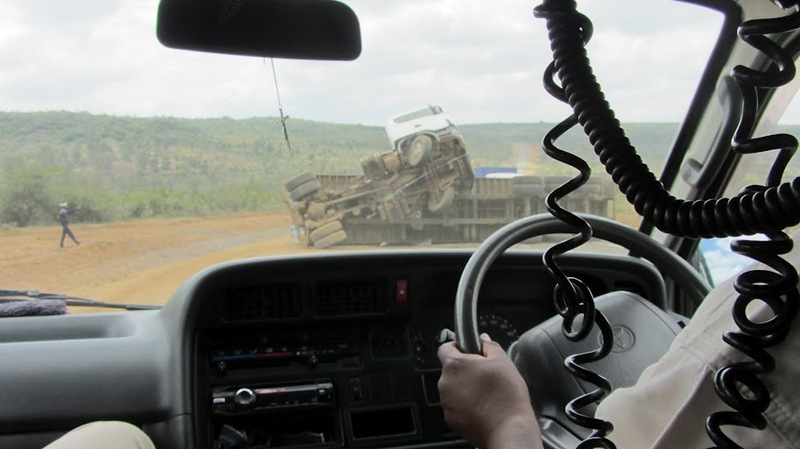 The Chinese are building miles of new roads in Kenya, so many of the normal routes had detours over dirt paths full of potholes. There were no lanes painted on the roads. Where the roads widened more cars filled poured in. As the roads narrowed the cars merged, coming with centimeters of each other. This didn’t slow anyone down. If a traffic jam filled the road in one direction drivers would take to the wrong side of the road. We closed our eyes tight as cars approached us at full speed head on. They always changed course within seconds of a crash. We really didn’t think we’d survive. But then we went to India. Like Kenya they are supposed to drive on the left side of the road, but driving on the wrong side of the road (the right side) was just as common. 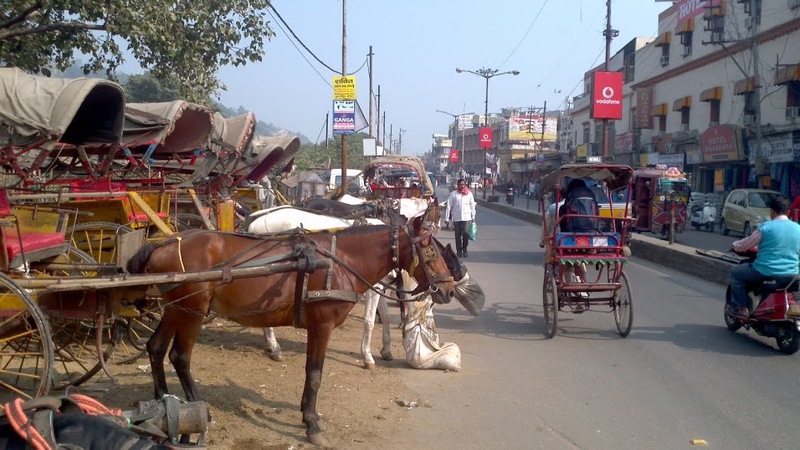 As we got stuck in a traffic jam on the way home to the ashram in Haridwar cars started passing on the right which only caused the traffic to jam up in the opposite direction as well. No one could move in either direction. And while in a taxi in Kerala we stopped at a railroad crossing with one car in front of us. Soon a motorcycle pulled up and stopped ahead of us on the right. Cars pulled up behind us and then more cars to the right. There were cars, buses, and motorcycles filling the road from left to right waiting for the train to pass and the crossing bar to rise. When the train did pass, the road across the railroad track was full from right to left of cars, buses, and motorcycles also waiting for the crossing bar to rise, facing us head on. Somehow when it was time to start up again the cars, buses, and motorcycles wove their way between each other and drove on. On Christmas day it took Vishal, our driver, six hours to take us from Ranthambore National Park, where we’d been searching for tigers, to Agra, where we planned to tour the Taj Majal. It’s only a 200 kilometer drive, 120 miles. 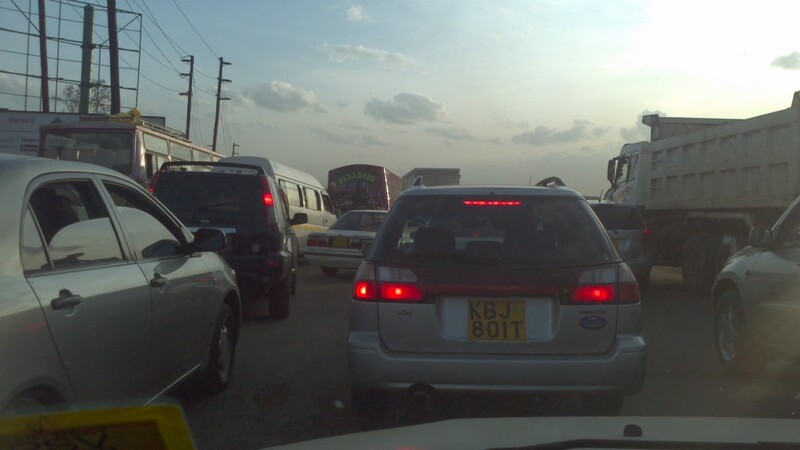 Unlike Kenya and Turkey it wasn’t just too many cars and trucks on the road that caused traffic to move so slowly. 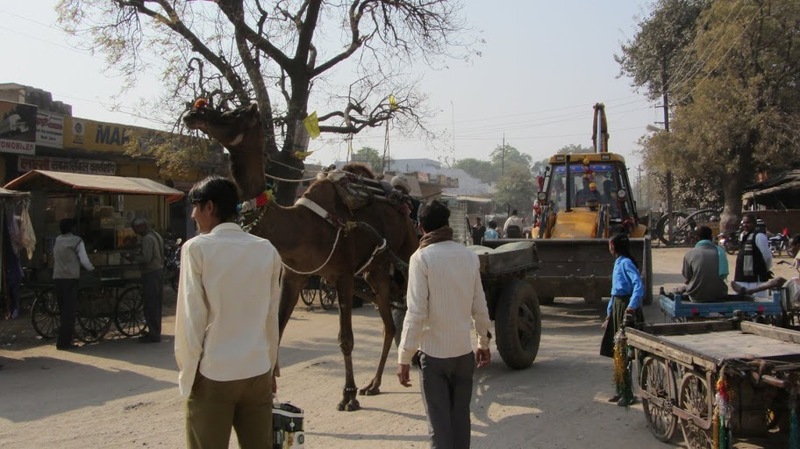 It was also the bicycles and pedestrians and motorcycles and vikrams and bicycle rickshaws and carts pulled by camels and dogs and pigs and, of course, cows lying down in the middle of the road, all which impeded our drive to the Taj. 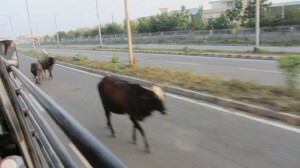 Vishal drove quickly for short bursts, then slowed and swerved around the brahmin cow chewing her cud with no regard for the mass of people trying to move along the road. 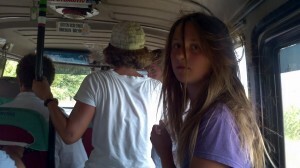 Catherine cried over a Christmas spent feeling car sick in India. When we got to Thailand we felt safe again. Like in Kenya and India, they drive on the left side of the road, but they actually stay on the left side, in their own lanes. They use turn signals and follow the traffic signals. The fact that there were traffic signals in Thailand made everything feel so much safer. 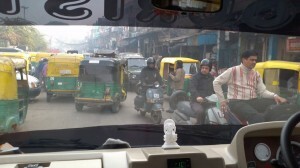 From that point on in the year whenever another traveler complained about the driving in some country, whether it was Mexico or Vietnam, we’d all say it was fine: it wasn’t even close to the chaos in India. 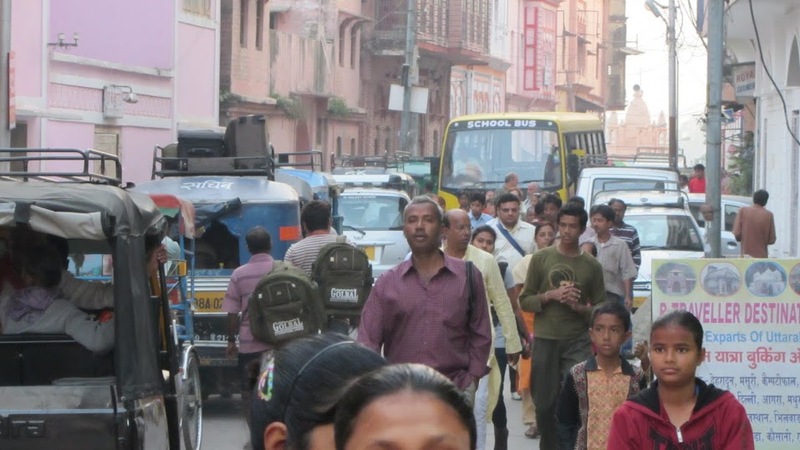 This entry was posted in Coming Home, India, Kenya, Thoughts on Travel, Turkey. Bookmark the permalink.